The Evil Dead Blu-ray is available in stores today. And to celebrate, Sony is throwing a Comic-Con bash for the fans! 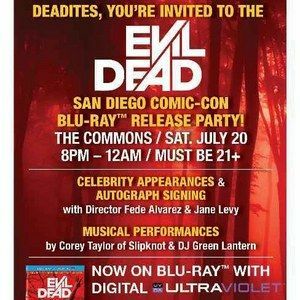 There will be musical performances from Corey Taylor of Slipknot and DJ Green Lantern, and a celebrity signing with director Fede Alvarez and Evil Dead star Jane Levy. Celebrate the goriest, grooviest movie of the year on Saturday, July 20, and make Comic-Con 2013 something to remember. Details are included on the flyer!